Help! My puppy poos inside the house! (Q) I have a problem with my new Great Dane puppy, Fiona. She refuses to go out to the toilet and will constantly come into the house and mess in certain spots. Every time I see Fiona preparing to do a poo or wee I try to grab her and put her outside. I stand outside with her while she wanders around our garden. After seeing her shaking from the cold I take her back inside, and minutes later she toilets. (A) Behaviourist Steve Goward says: As a young pup she may just need a little more time to adjust to the huge change that has just occurred in her life. Being taken away from Mum and her littermates is bound to be scary. It is essential that you do not punish her for inappropriate toileting, as this will often just make things worse. She is likely to be feeling insecure and anxious and any punishment for toileting could create a very negative emotional state in association with you. Go out regularly and give her plenty of opportunity to get it right. Let her know how pleased you are with her when she does toilet in the right place by giving a high-value reward. 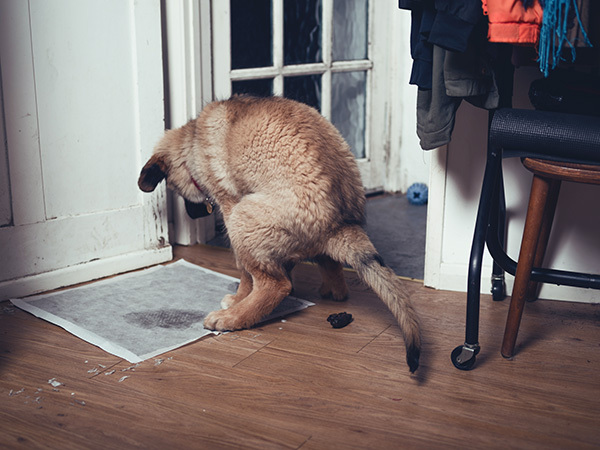 With persistent toilet-training problems, I advise the owner to keep a toilet diary so they can start to build up a picture of when and where the accidents occur. With this information you can start to predict when your dog needs to go and give them the opportunity to be in the right place at the right time. Will she toilet in front of you? If the answer is no, she probably has some anxiety about doing it, due to your reaction when she has toileted previously. Even a cross face and stern words can be enough to start a young pup down the anxiety path, so stay calm and patient, and remember each puppy learns at a different rate.